Text description provided by the architects. 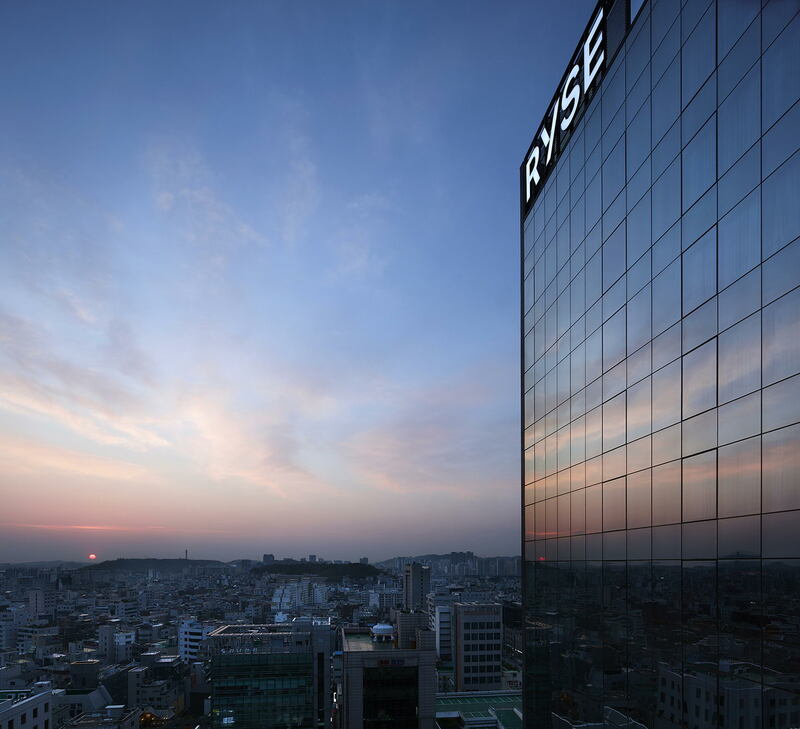 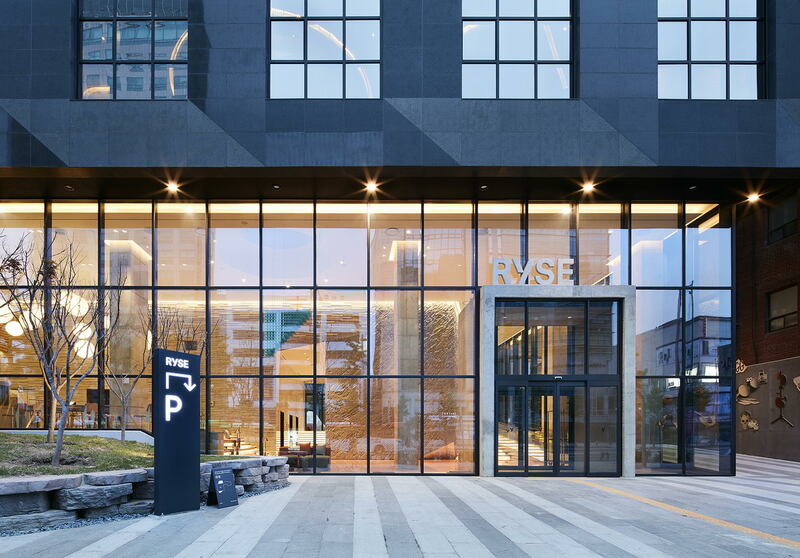 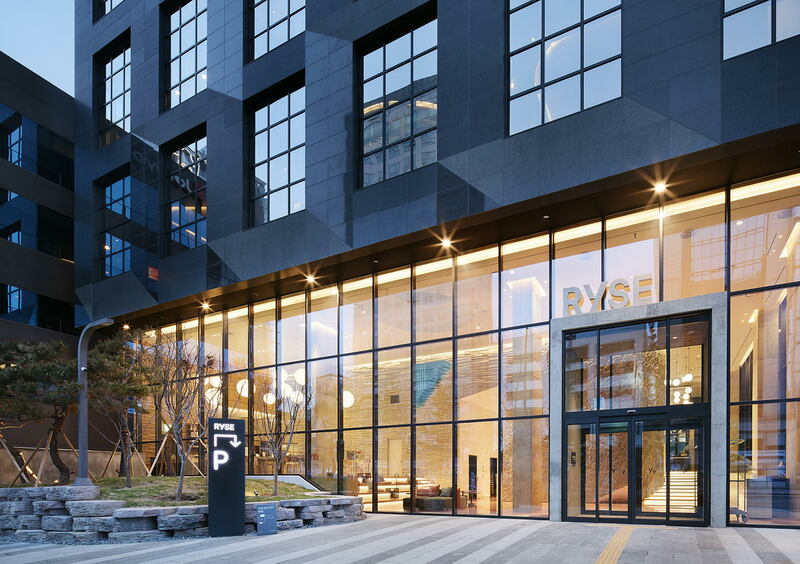 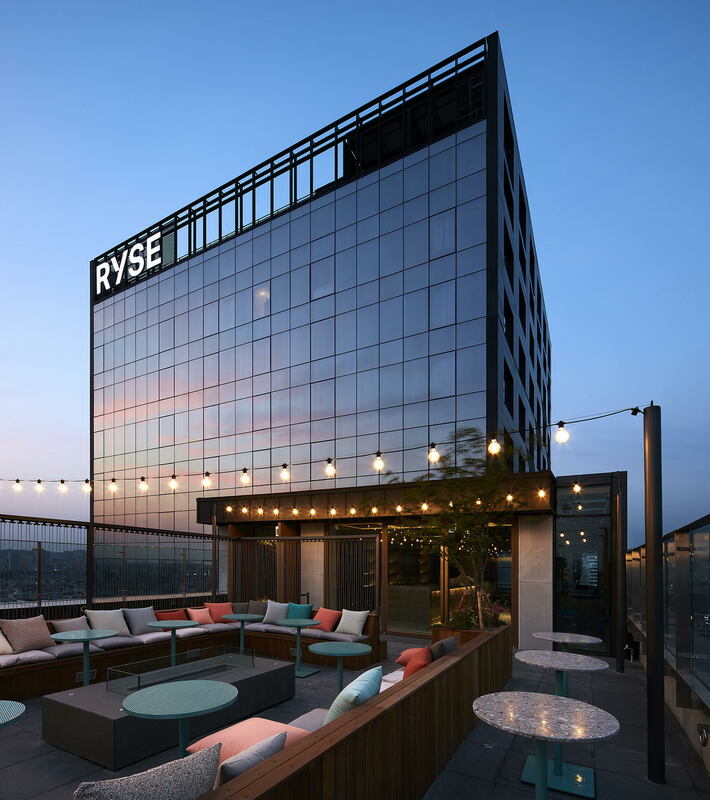 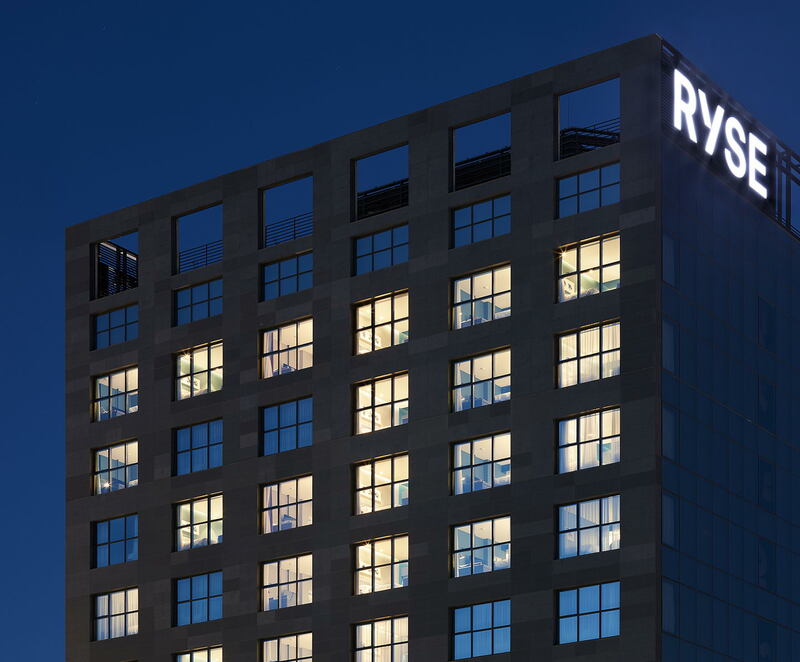 Designed by SCAAA, RYSE Seoul is a new Autograph Collection hotel in the bustling neighborhood of Hongdae, known for its creative energy and nightlife as well as its proximity to Hongik University. 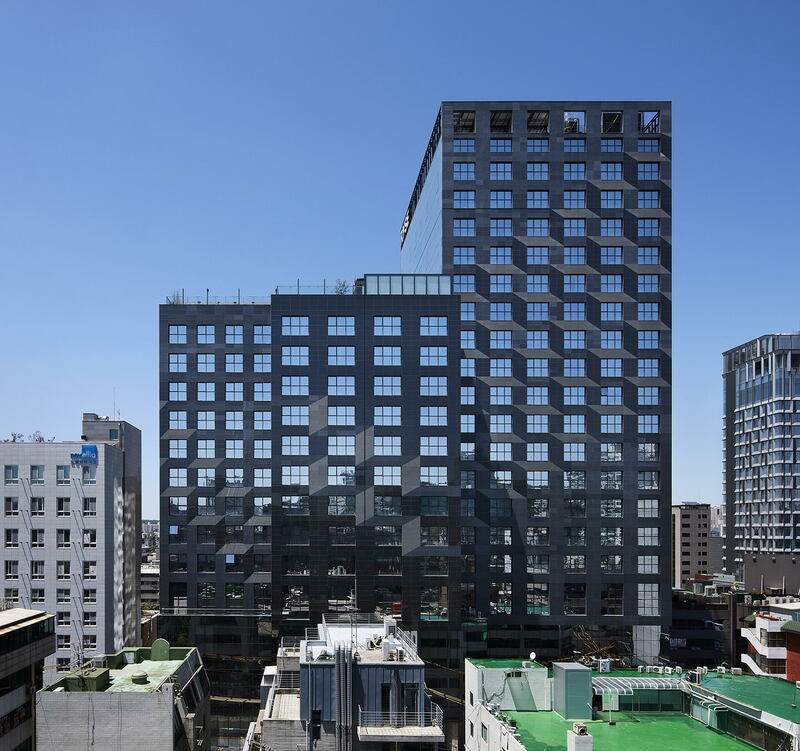 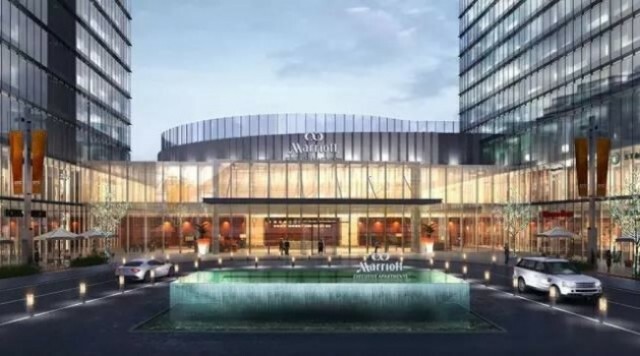 Containing 274 guest rooms on 20 above-ground floors, the new 314,500 sq.ft (29,219 sq.m) hotel replaces an existing high-rise business hotel which fronted onto the heavily trafficked Yangwha Road. 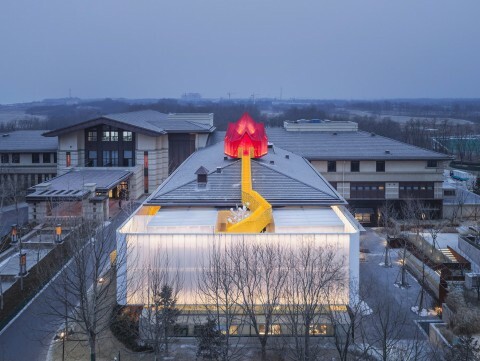 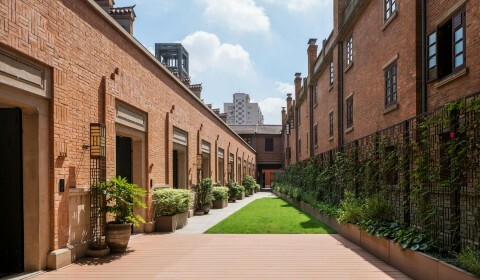 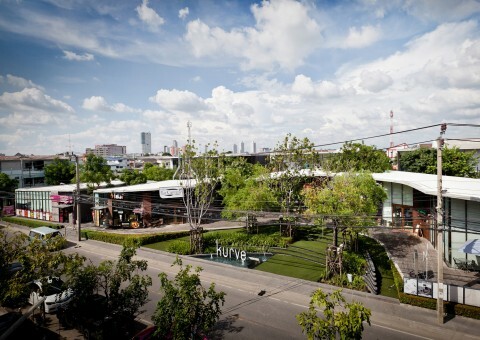 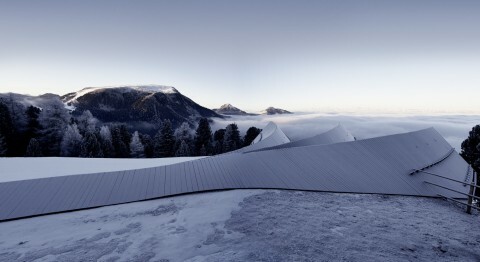 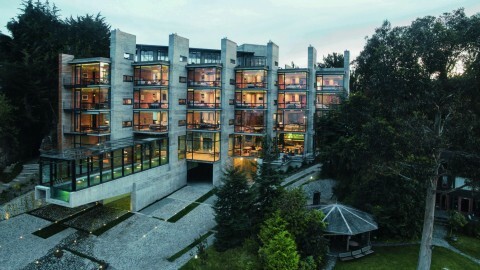 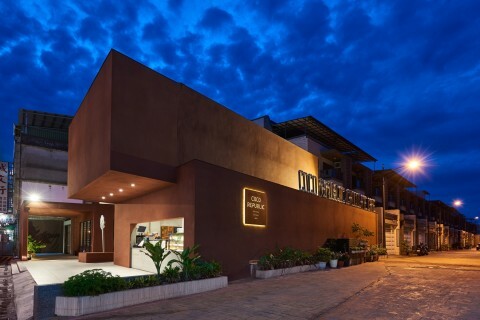 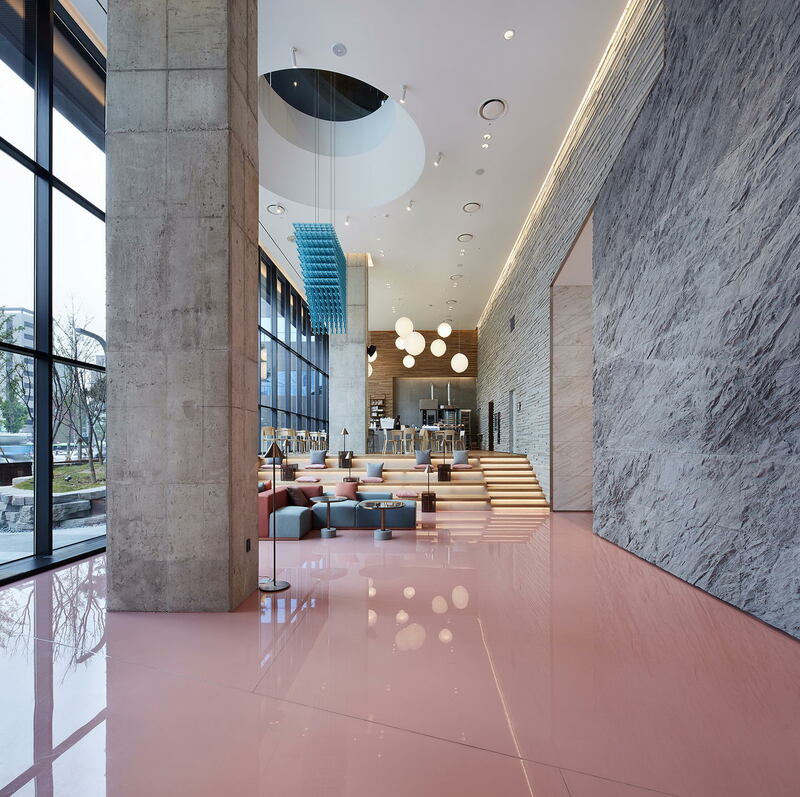 Beneath the 26,180 sq.ft (2,432 sq.m) urban site, the hotel’s design provides five floors for an art gallery, parking, loading and support functions. 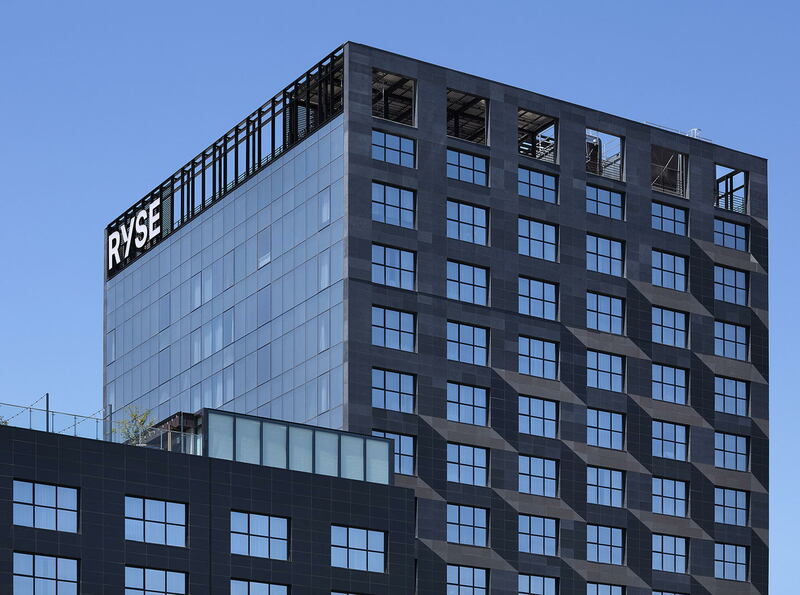 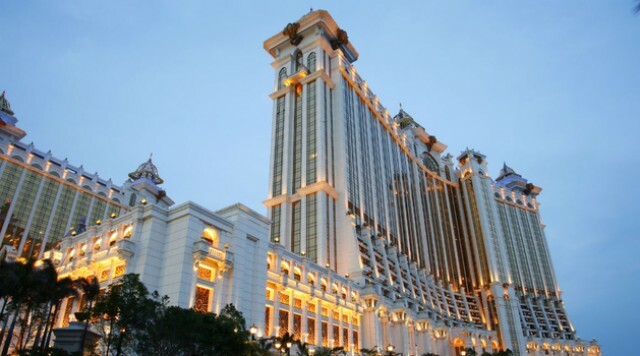 Construction of the hotel was completed in March of 2018. 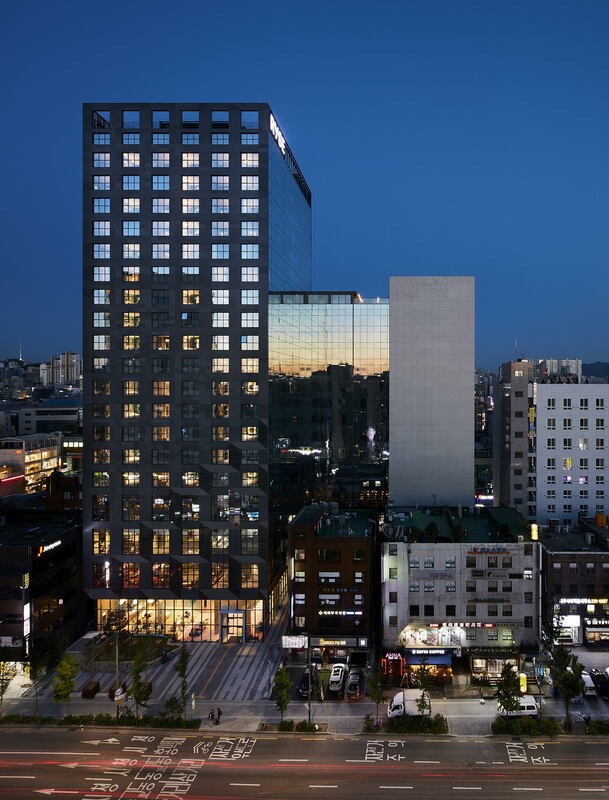 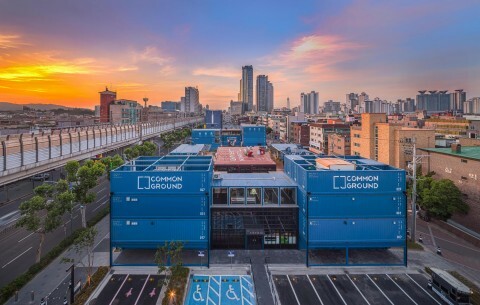 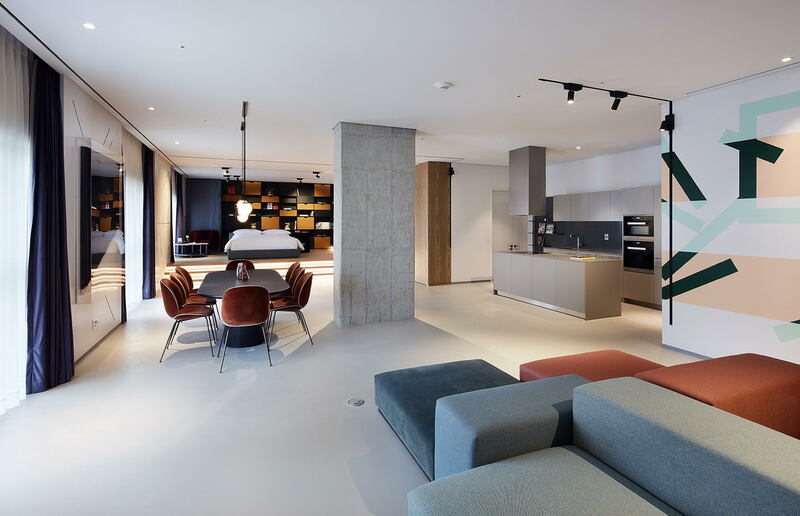 From the early conceptual phase, the hotel design was intended to be a discreet backdrop to the activity of the neighborhood, addressing both the busy boulevard on one side and the eclectic energy of Hongdae on the other. 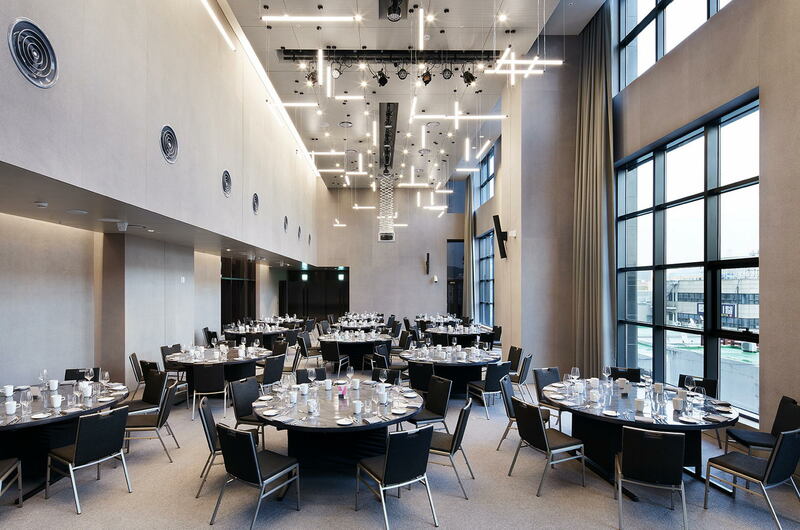 Similar to many of the eclectic buildings of the surrounding neighborhood, where uses have evolved over time, the public functions of the hotel—main lobby, restaurant, lounges, meeting rooms, banquet space—extend up through the fifth floor in an unconventional layout, with private guest rooms beginning at the sixth floor. 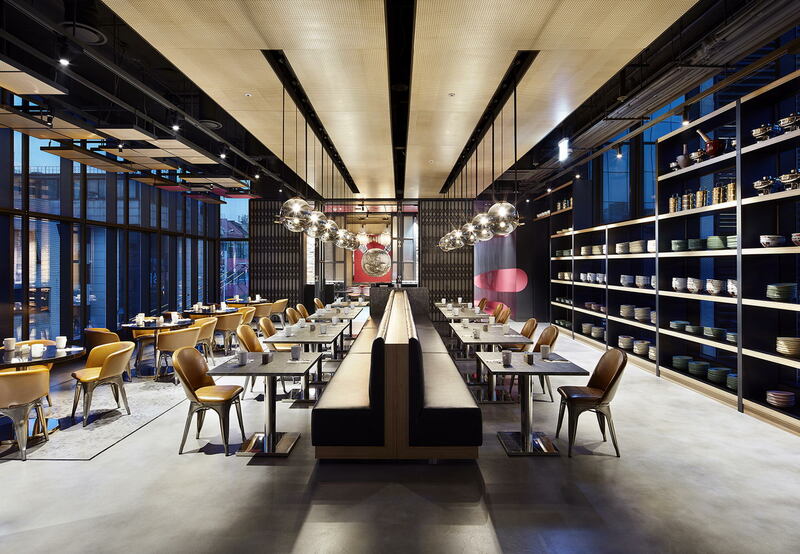 Close to street level, generous glazing maximizes visual connections between guests, retail customers, and passersby. 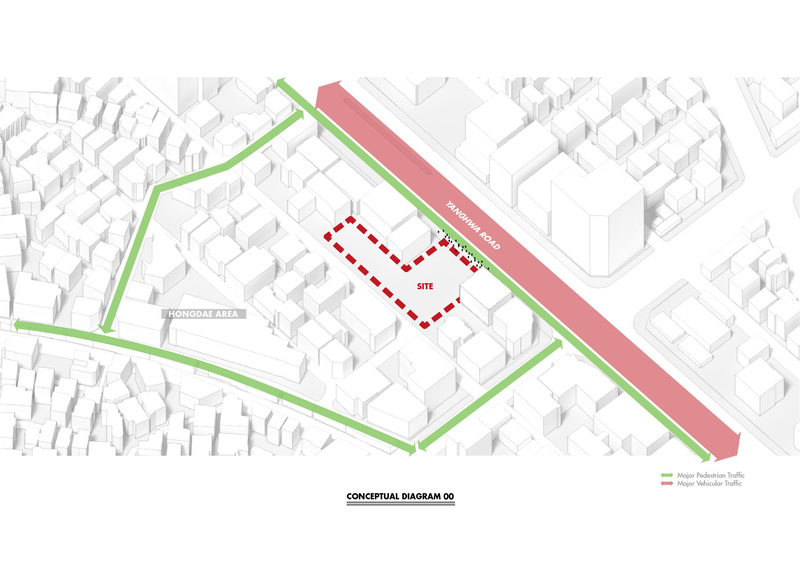 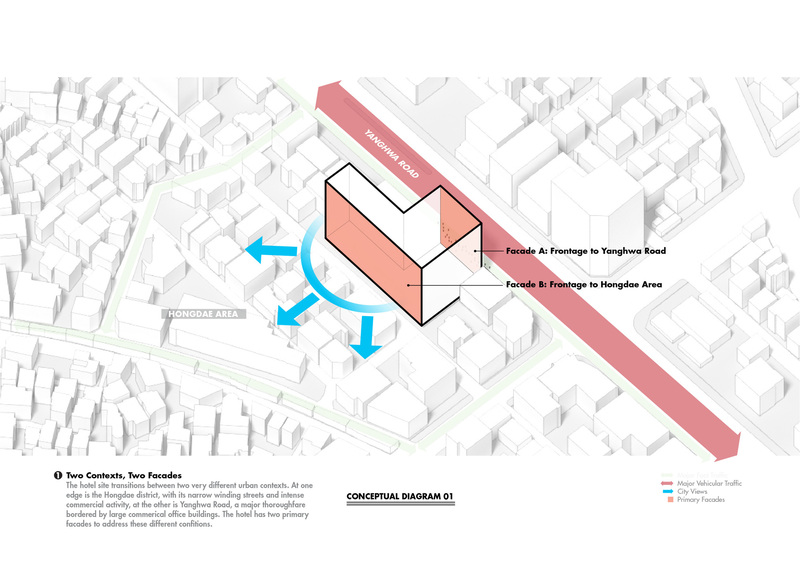 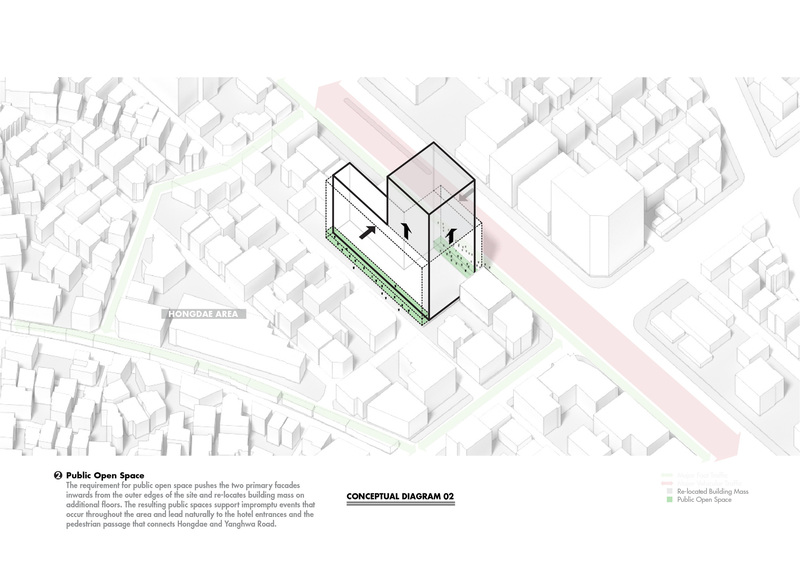 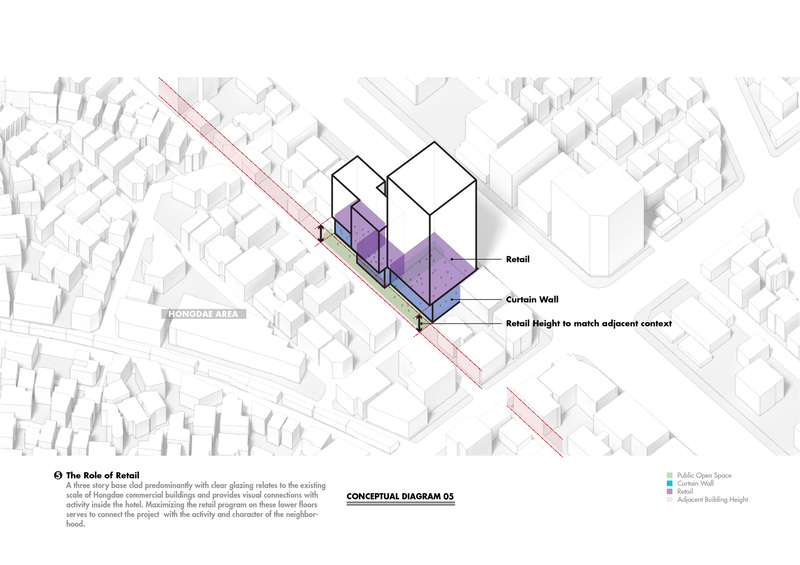 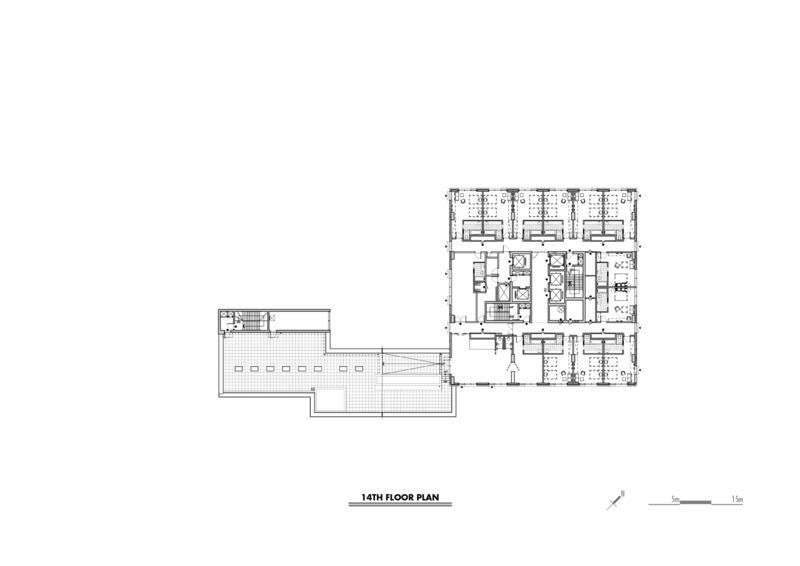 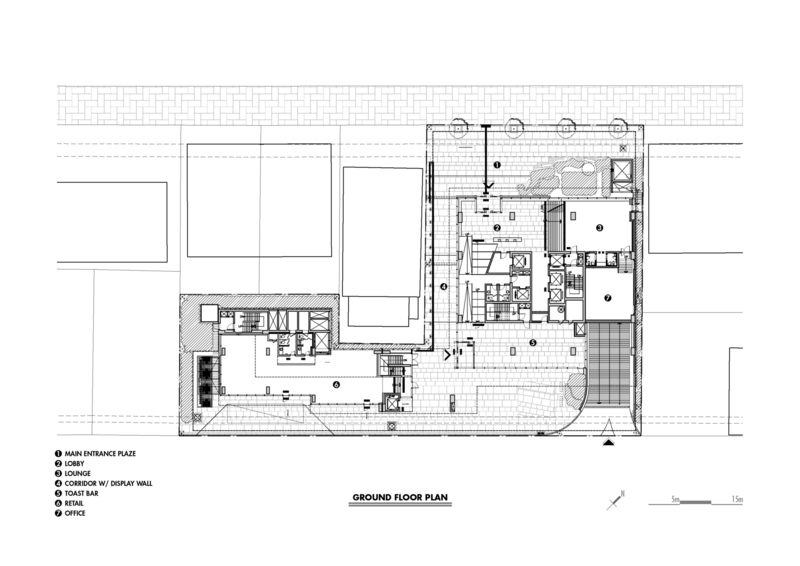 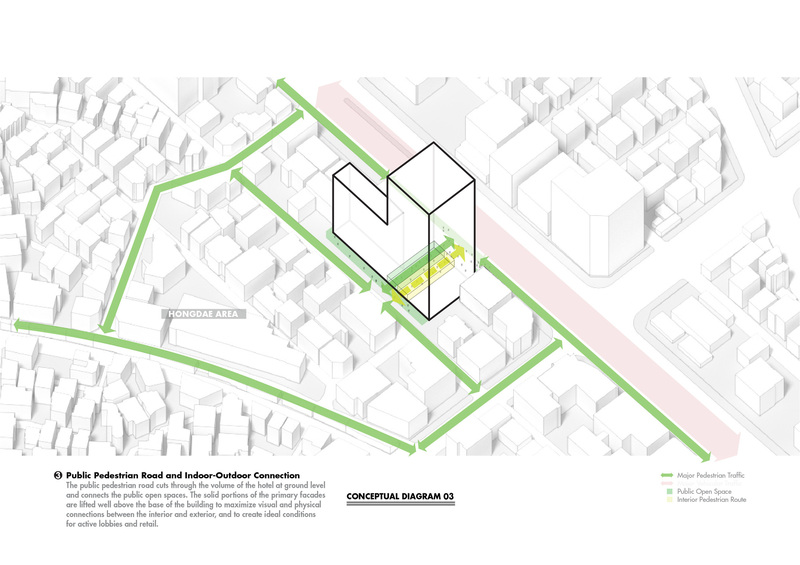 A pedestrian walkway which bisects the ground floor, while connecting the two public streets that frame the site, and large sections of street-facing operable openings in the retail cafe, also maximize permeability and interaction at the neighborhood level. 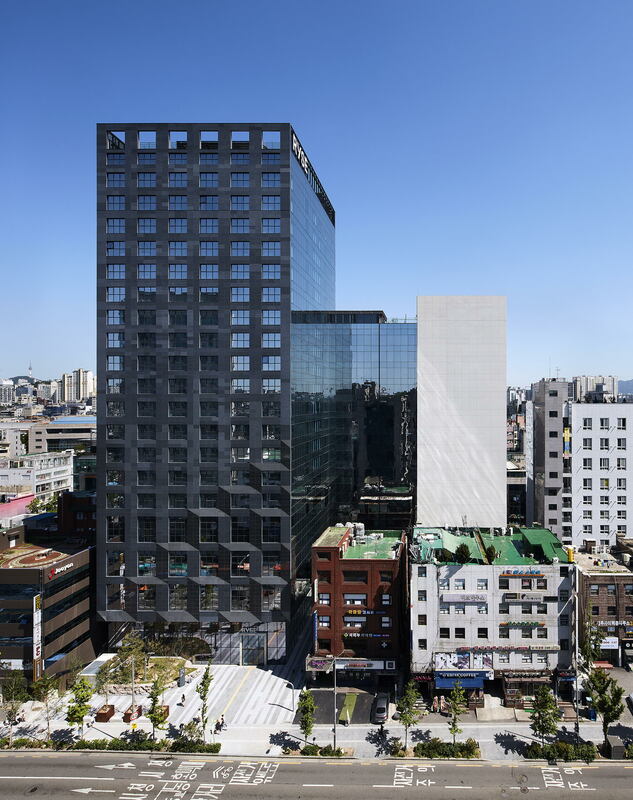 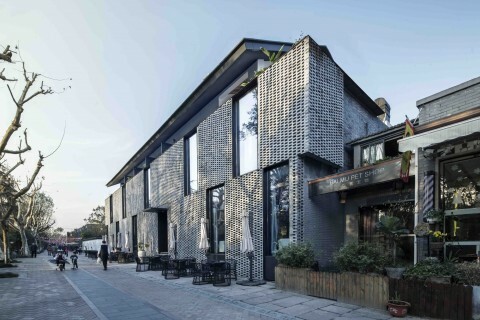 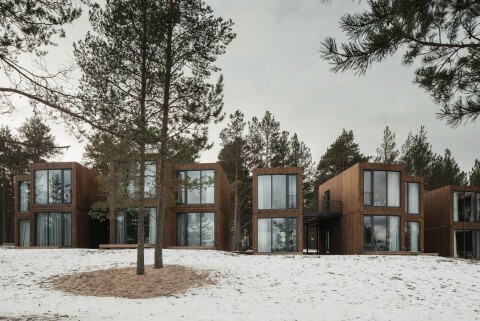 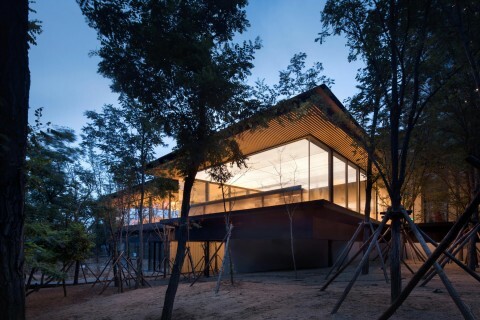 The outward appearance of the building is composed of a simple, elegant material palette of black granite and structurally glazed curtain wall. 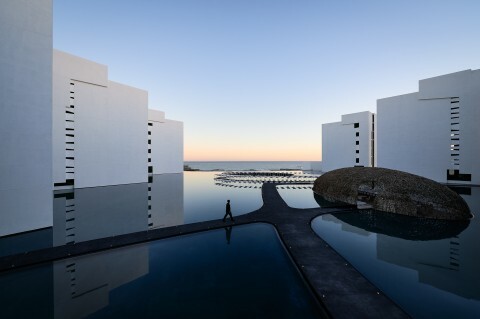 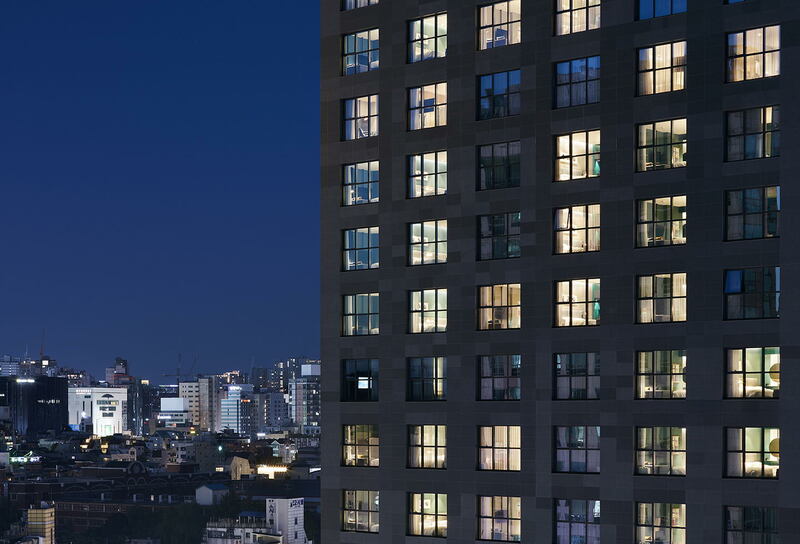 The facades of the upper floors of the hotel employ uninterrupted expanses of glass to reflect the changing character and texture of the neighborhood during the day and hint at the life within after sunset. 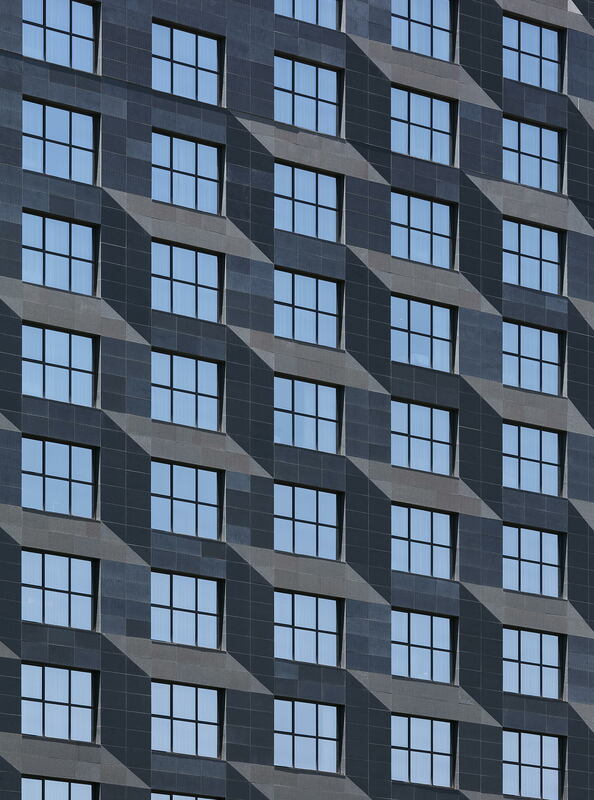 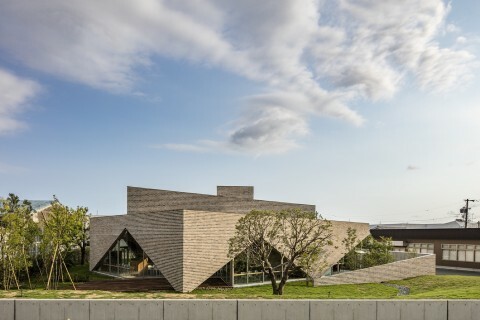 The granite facades seem to hover over the all-glass base of the building, and three different textured finishes are employed in a dynamic pattern that creates the illusion of three-dimensional space on the surface of the building. 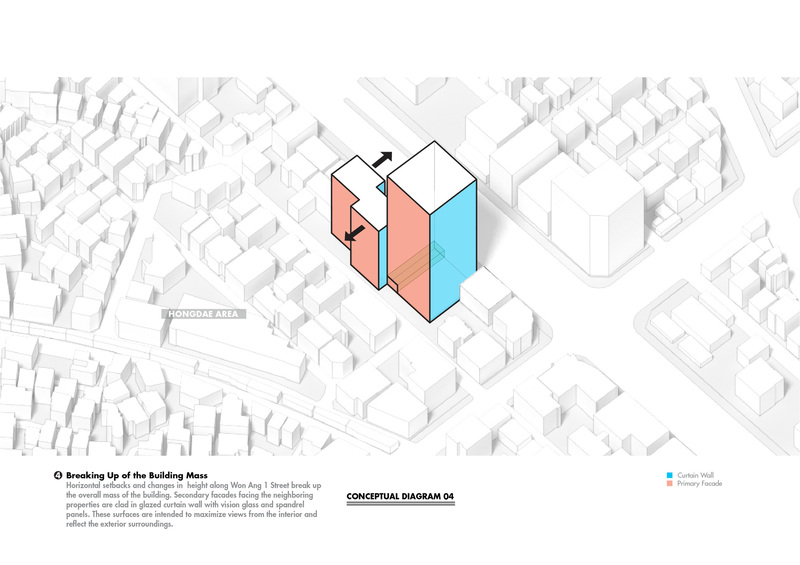 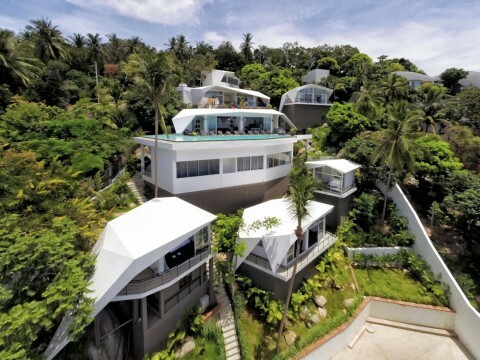 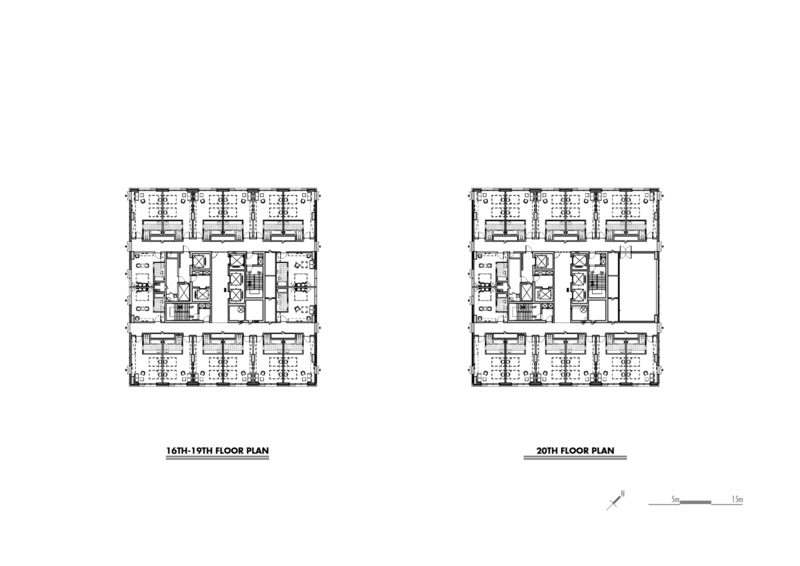 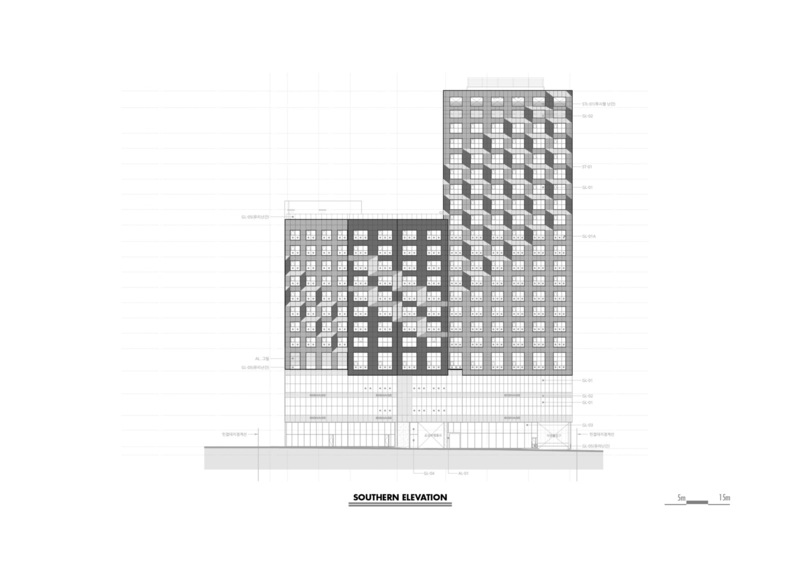 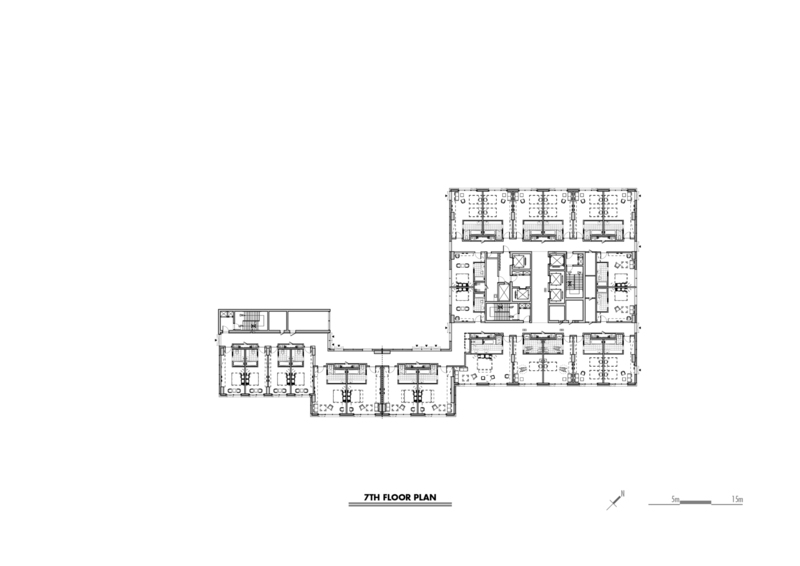 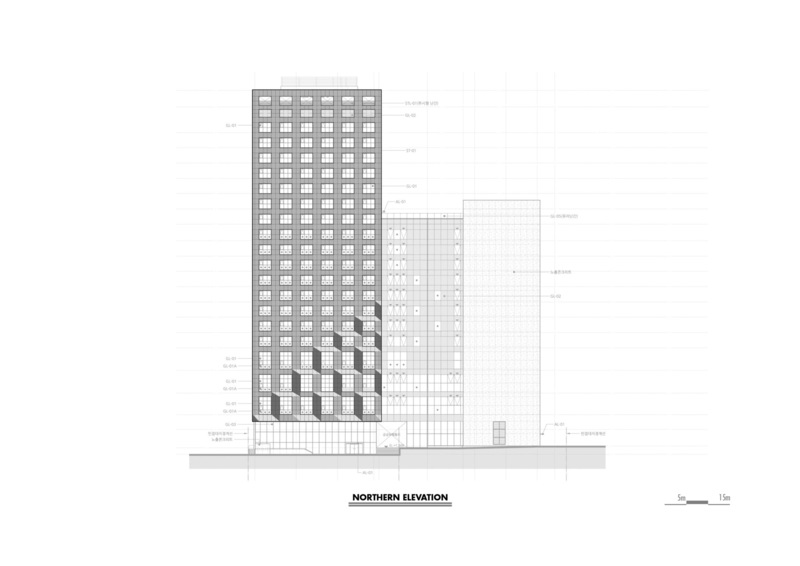 These elements—components of what SCAAA likes to refer to as “second look architecture”— are all intended to provide an evolving perception of the building; new aspects of the building’s design can be revealed to observers over time.